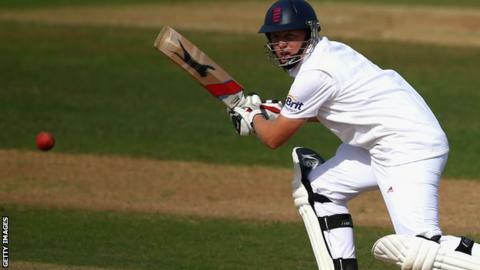 Yorkshire batsman Gary Ballance hit a century for England Lions in the tour match against Australia. Ballance struck 104, including 16 fours and a six, as England closed the first of the match's two days on 269-7. England elected to bat after rain delayed the start until 14:00 BST, with 77 overs bowled before the close at Wantage Road. Worcestershire's Moeen Ali made 61, while Nathan Lyon was the pick of the tourists' bowlers with 3-80. Luke Wells edged James Faulkner to wicketkeeper Matthew Wade in the sixth over for 10, but fellow opener Alex Lees steadied matters before falling to off-spinner Lyon for 33. Captain Eoin Morgan made only five, but Moeen looked comfortable in reaching 50 off 85 deliveries until he was caught by Steve Smith off Mitchell Starc. Left-hander Ballance took charge following the dismissal of Ben Stokes for 19, dominating a stand with Jos Buttler and going to his century off 153 deliveries by hitting leg-spinner Smith over midwicket for six. Smith had the last laugh by trapping Ballance lbw with the next delivery, but Keith Barker and Liam Plunkett saw England through to stumps. This is Australia's only tour match before the final Ashes Test against England at The Oval, starting on 21 August. England secured a series win with victory in the fourth Test earlier this week.